Welcome to a unique field in veterinary medicine, where the work is never dull and practitioners interact with a host of diverse — and sometimes dangerous — creatures. and worked for several years with the Navy Marine Mammal Program in San Diego. In 2005, collaboration with a colleague at Chicago’s Shedd Aquarium led to a job offer, which Dr. Van Bonn accepted. Aside from a sabbatical in 2009, he has worked at the aquarium ever since. 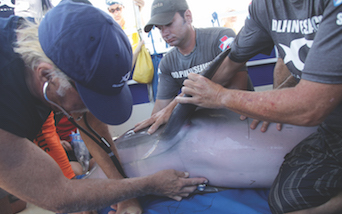 a career path that included stints at the University of Miami Miller School of Medicine, Miami Seaquarium and Florida Atlantic University’s Harbor Branch Oceanographic Institute in Fort Pierce. 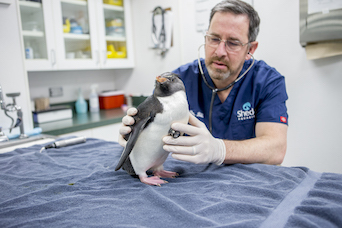 Leigh Clayton, DVM, director of animal health and welfare at the National Aquarium in Baltimore, also started in small animal medicine before moving on to zoo medicine. Her experience in avian medicine secured her current position. Most aquarium veterinarians spend little time interacting directly with their facility’s collections. 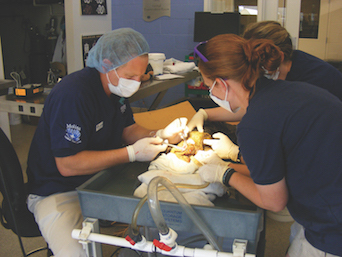 That is left to the husbandry departments, which oversee specific animal populations and act as the medical staff’s eyes and ears, notifying them when an animal appears ill.
Training also allows curators and veterinary staff to better understand the animals, Dr. Van Bonn added. Whales, for example, sometimes exhale forcefully — a coughlike behavior known as chuffing. Veterinarians can learn much about a whale’s health and physiology by collecting the chuff and measuring hormone levels and other vital functions. common issue, according to Dr. Adams. Emergent issues are also in a day’s work at the nation’s public aquariums, and some cases become memorable. Dr. Van Bonn once performed complicated knee surgery on a bullfrog (the patient recovered nicely), and Dr. Clayton recalls performing exploratory thyroid surgery on a knob-tailed gecko that resulted in removing a large cyst. The patient was then placed on a thyroid supplement, with the dosage determined by heart rate and shedding frequency because the animal was too small to provide a relevant blood sample. Because little may be known about their patients’ health and physiology, aquarium veterinarians frequently find themselves extrapolating and innovating on the spot. Entire books cover the subject specific to dogs, cats and birds, but no textbooks exist for treating beluga whales, manta rays or electric eels. As a result, aquarium veterinarians commonly confer, sharing information within their small community as it becomes available. Because patients can weigh hundreds or even thousands of pounds, special equipment must be devised for hoisting and transport. At the other end of the spectrum, veterinarians use magnifying devices to examine and work on their smallest patients. Darting equipment, commonly known as jab sticks, is sometimes used to administer medication to species that are difficult to catch or would be too stressed by the attempt. To promote innovation, Shedd Aquarium partners with the Northwestern University McCormick School of Engineering in Evanston, Illinois, challenging students to create custom equipment that would benefit its animals, such as an enrichment device for otters.  When a trainer tosses in a special hollow ball stuffed with shrimp, the otter learns to slide the ball through the plexiglass maze to an opening at the bottom. the blood of horseshoe crabs, an important project because almost nothing is known about the health of these living fossils. The Aquarium of the Pacific is working to help save the severely endangered Guam kingfisher, as well as exploring ways to promote shark reproduction in captivity. in aquatic medicine are broad, including large public aquariums, state fish and wildlife agencies, and community veterinary practices that provide services to fish enthusiasts. Interested students and practitioners are encouraged to attend meetings and conferences that emphasize aquatic medicine, and explore opportunities to shadow working aquarium veterinarians.